very bright, stylish, fun! I like your fur jacket! I LOVE the sweatshirt so much. Great pairing with the bag and coat. Absolutely beautiful coat. Leuke 3e foto! En wat een mooie outfit! Wat een leuke, mooie foto's! En leuke outfit! Super cute pictures!!! The purse is SO nice! Echt hele leuke en mooie foto's! Super mooi!! Ik vind je jasje super!! Wat een fijne outfit mooi jasje! Oh man it must be freezing! I have had some photo shoots like this back in Germany in the mountains! i;m following on bloglovin, would be great if you could follow back! Jumping photo is so cute haha. i really love the photoshoot! and the one where you seem like levitating! Je foto's zijn altijd super mooi! Mooi! Heel gaaf tasje & wat heb je mooi haar! 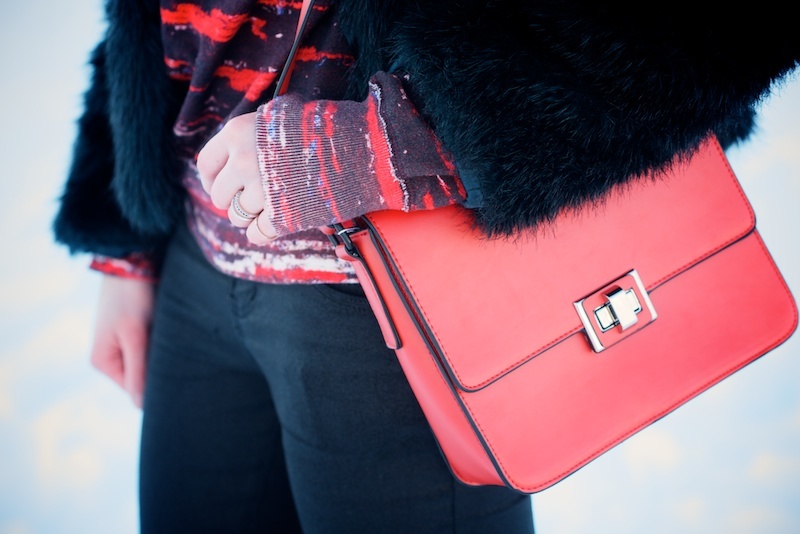 Love the color coordination between your isabel marant pour h&m sweater and zara bag. Also great job at balancing bright colors with dark! You pull off the faux fur coat very well! beautiful photos! I hope your staying warm!! Love your top hun. Great blog by the way. mooie outfit :) vooral je trui springt eruit! You look so beautiful with that black fur on the snow, and look at that smile! Gorgeous! woww You look amazing! veri nice blog i follow you now! Love the top!!! Stay inspiring! Very nice winter style and beautiful pics ! Thank you for your visit on my blog ! Kisses from Paris !